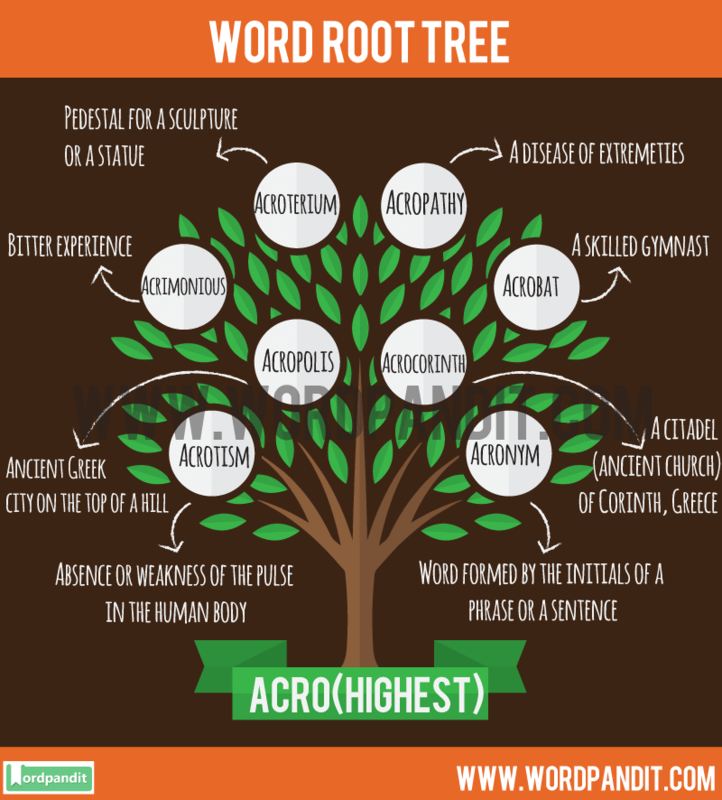 What does Acro Root Word mean? The word acro is derived from the Greek word akros which means topmost or highest, also akin to Latin word acer, which means sharp end. Most words containing this root word may also mean something close to bitter, sharp or angry, as derived from Latin word acer, which means sharp. Acro: Meaning ‘height’ , extremities of a body or a tip-end. Ajay never agrees to go on dangerous rides in the amusement park. I feel he has acrophobia. 1. Acrobat : A skilled gymnast. Also , a person who readily changes viewpoints or opinions. 2. Acrocarpous : Used in Botany. Plants that have reproductive organs at the end of it’s primary axis. 3. Acrocorinth : A citadel(ancient church) of Corinth, Greece. 4. Acrocyanosis : A condition characterised by blueness of fingers or toes due to extreme conditions. 5. Acrolein : A yellow , flammable liquid obtained by the decomposition of glycerol. 6. Acrolith : A sculpture having head and ends/extremities of stone and the mid-section of other materials. 7. Acropathy : A disease of extremeties. 8. Acrophony : Use of a word as the name of alphabetical symbol representing the initial sound of that word. 9. Acroterium : Pedestal for a sculpture or a statue. 10. Acrotism : Absence or weakness of the pulse in the human body. 11. Acromegalic : A person suffering from Acromegaly, which is a disease in which there is excessive secretion of growth hormone due to which the bones in the head and feet are larger than normal. 13. Acropolis : Ancient Greek city on the top of a hill. 14. Acronym : Word formed by the initials of a phrase or a sentence.